Application to administer much faster your online PrestaShop store. 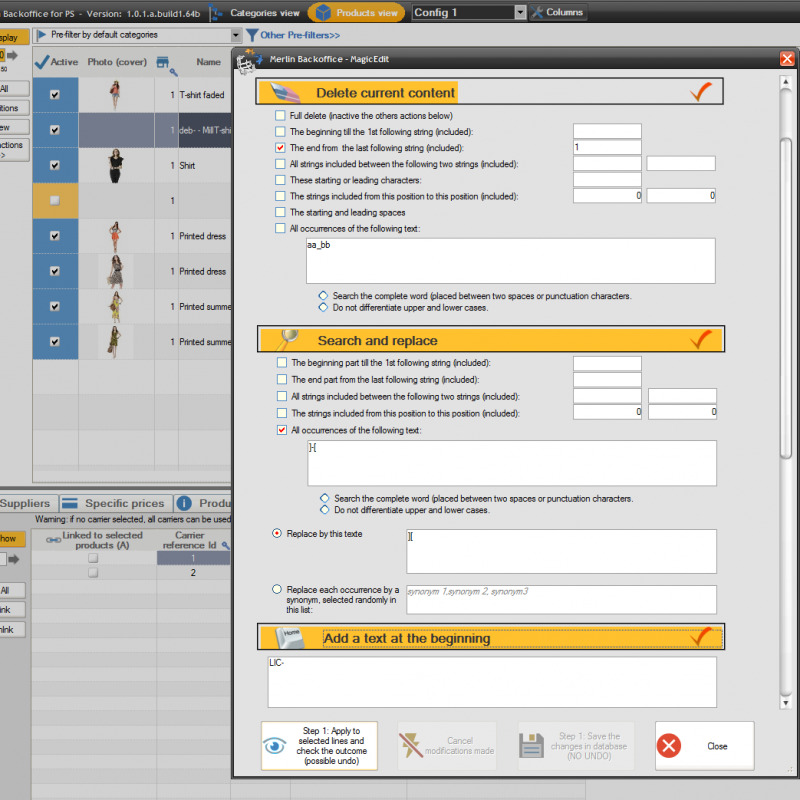 Simple and reliable, a Windows back-office module to radically improve the management of the e-business catalogs. Merlin Backoffice ® is the perfect merge of our best sellers PrestaShop modules : PrestaPricing for the bulk edit of products and CSV import, and PrestaCatégories for the fast creation and updates of categories. Bulk manage your store 10x to 1000x faster with our innovative store managment solution. 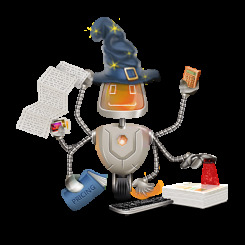 Reminder: Merlin Backoffice ® is the perfect fusion and replacement of our two best sellers addons, PrestaPricing for mass product management and CSV import, and PrestaCategories for creating and updating categories quickly. It integrates all their features and adds new ones, with a more modern and easy to use interface. Creation and mass modification of products. Mass editing of texts (search for replace, copy a column in another etc). Cloning of characteristic values ​​(and attributes) between characteristics (and group of attributes). Ultra fast plug-in mode with HTML editor to quickly change your category pages. Association of categories and products. Bulk associations between categories and client groups. 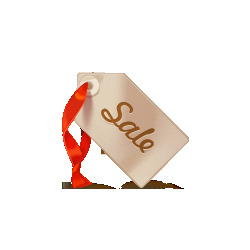 Management of discounts by categories and customer groups. Association of categories to shops. Association of products to shops (transfer of articles between shops). Requires also the "Products management" base feature. One hundred other features that it is impossible to present. Import and update of products (and categories with the "Category management" function). Creating and modifying combinations and attributes. Creating, modifying, and combining features. More than 70 fields are importable. Column mapping tool to adapt to almost any format. Planning and automation to realize imports at night. Automatic calculation of selling prices. Management (deactivate, hide ...) automatically obsolete or out of stock products. Automatic download of csv / xls listings from wholesalers server. Filtering rows to import or not. Stock update in absolute or incremental mode. 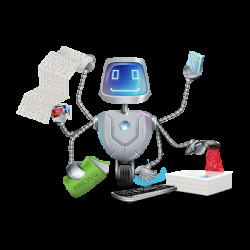 Automatic detection of PrestaShop's advanced or manual inventory management mode. Lets you switch products in manual or advanced mode. Allows you to change modes globally without losing the current quantities. Allows, also on a selection of products, to define how their quantities are calculated. Associate by batch products and declinations with warehouses and define their location. Create inventory movements on hundreds of items in seconds. View globally the physical, replenished or available quantities, on all the products of your choice. Calculation of sales volumes over the period of your choice and the sales coverage of each product (time before being out of stock). Full support for multi shops. Numerous options for defining purchase prices when adding quantities in warehouses. Requires PrestaShop 1.5 or 1.6 (and 1.7 in futur when the advanced mode is supported by PrestaShop). Current limit: Advanced mode is not supported by the csv and xls import addon. Hyper-fast, up to 100 times faster than the PrestaShop back-office generator. Can generate on a large number of products at once. No problem with timeout or server blocking when creating several thousand combinations. Has a mode allowing to recalculate and modify the price impacts of the attributes and the declensions. Can generate references and quantities. 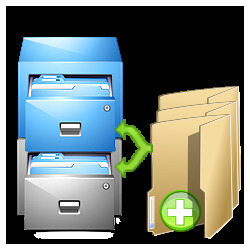 Allows to duplicate all or part of the declinations of other products. Many options and modes of operation to adapt to all needs. A must have for all sites containing products with variants. Search and repair of ROOT category (hidden root). Removal of duplicate ROOT categories. Search and retrieval of orphan categories. Cleaning of tables that still contain deleted categories information. Repair of links between categories and shops. Repair missing critical information, such as name and re-written url of categories. Remove holes and duplicates in the position (order) values ​​of the categories. Cleaning of tables still containing obsolete data of missing products. Repair of category orphan products. Repair of missing links between products and shops. Removal of incorrect associations between products and categories. Cleaning of holes and duplicates in the position (order) values ​​of the products. 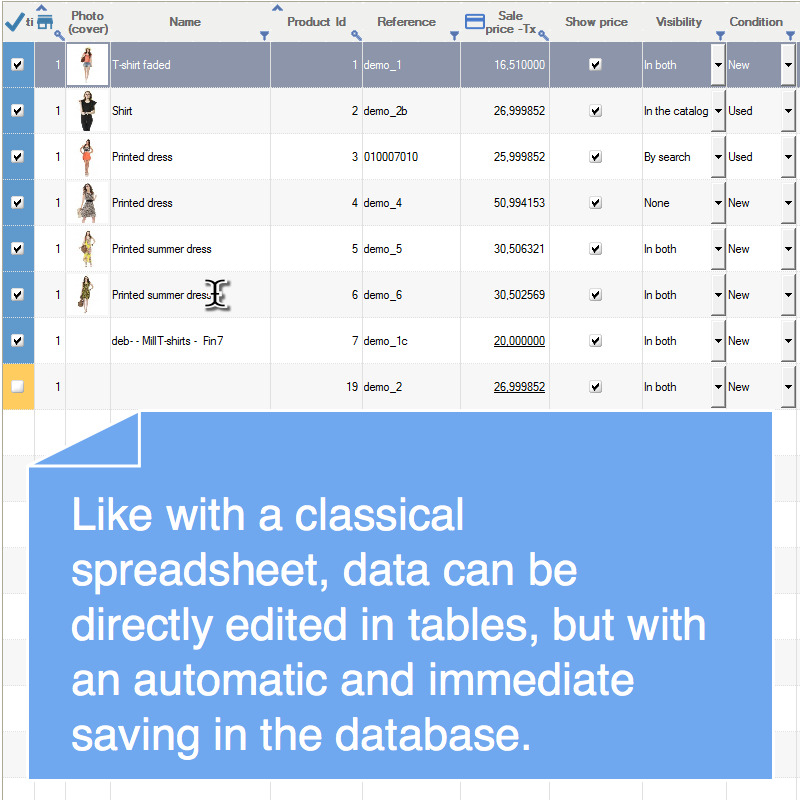 Create CSV or Excel files of your products, declinations, categories (according to basic functions). To re-import them to another database with the import module or to migrate PrestaShop from one version to another. Customization of exports to adapt to the formats requested by the marketplaces. Pre-formatted and customizable catalog generator. Free choice of categories, products, combinations and columns. All-sized label generator with customizable content. A major addition to Merlin Backoffice. Allows to create an infinity of configurations of the tables, memorizable and re-usable. Simple management by drag and drop. Modification of mass text fields (name, description, SEO, reference, ean, ...). Works with a single click on a selection of products or categories (depending on the basic functions). Find a string and delete it. Look for a string, a sentence and replace it. Look for a word and replace it with a synonym taken at random from a list. Add text before or at the end of the existing text. Copy (or concatenate) one column to another (eg short descriptions in meta description). A dozen conversion options (ex: in capital letters, html to text etc ...). Generate a series of barcodes ean13 or upc. Detects the presence of the Cache Manager module of Presta Modules and allows to empty the cache. Detects the presence of one of the many multi-value characteristics management modules (eg Multiple Features by Presta Modules) and then allows in a single operation to display and associate several values of the same feature with one or more products.